Especially for this Halloween weekend, here’s a very special Halloween mix from international break-beat and remix DJ Krafty Kuts and the very talented Stereo:Type, who together have packed in 54 tracks into one jam-packed hour. 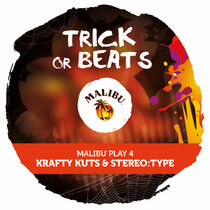 Every month their DJs create a totally original new Malibu Play mix packed full of audio goodness, and this special spooky-themed session is a real party-starting trick and treat, full of fun anthems, old skool classics and hands in the air moments! Ghoulish tunes include ‘Ghostbusters’, ‘Voodoo People’, ‘Sympathy For The Devil’ and many more. We’ve been playing it a for a few days now and are loving it! Turn it up below.